Building on 25 years’ experience delivering and managing impactful face-to-face mentoring programmes for professionals, our new digital offering, eMentor Me, will enable that same support for young people but online rather than in person. We have seen first-hand that many employees have the talent and will to engage in volunteering, but find it hard to commit to the time required away from their jobs. eMentor Me has the potential to change this. 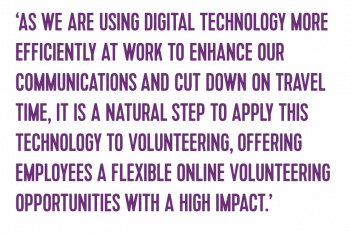 eMentor Me is digital 1:1 mentoring programme for employees who want to mentor young people looking to develop their skills and enhance their employability. Mentors and mentees are matched based on shared interests and goals and supported by our experienced volunteer managers. The programmes on the eMentor Me platform utilise state-of-the-art mentoring techniques and scientifically proven e-learning material all integrated into the platform, allowing mentees and mentors to meet regularly in digital conference rooms, connected via video chat. If you are an employer and are interested in eMentor Me as an employee volunteering offer for your company, or if you are an organisation and would like to refer potential mentees to a mentoring programme, contact Gethyn Williams at gethynwilliams@volunteeringmatters.org.uk.